That totally depends on the hypothesis, but yes, there are negative hypotheses that can be proven. Imagine you and me are in a small bedroom, let’s say it’s 12m2, and I suddenly claim that there is no one meter tall baby elephant in the room. “Are you talking about a spiritual elephant ghost?” you ask. You have just proven my negative claim. If I claim that God exists, that he is allmighty, that he doesn’t interfere with the material world we are living in (tho’ he could if he wanted to), that he cannot be detected by any modern equipment, that he is invisible and cannot be seen or identified with any of our senses, or by any animals sense, then you cannot prove he doesn’t exist (you can also not prove he does exist, but that is another matter). Looking at the two previous examples, we can conclude that there exists a spectrum of provability of negative hypotheses. The more difficult the attributes are to prove, the harder it is to prove the negative hypothesis. It is important to emphasise that the provability of a hypothesis depends on the testability of the attributes and on the connectedness of those attributes to their cause (i.e. god). 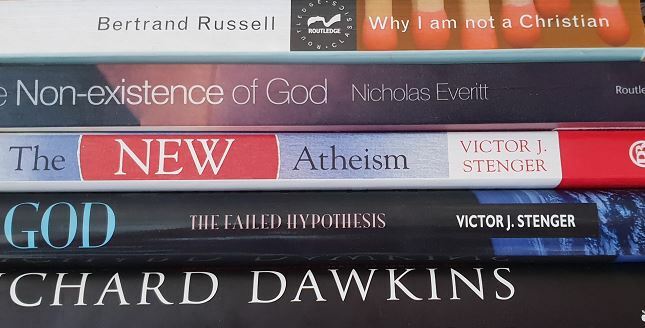 If it is not claimed that God causes effects xyz, or that God has attributes abc, then of course proving that there is no causal relation or proving that those attributes do not exists has no bearing on that God. But iff (i.e. “if and only if”) someone claims that his or her God has attributes abc or causes or has caused effects xyz, then we are perfectly able to weigh, measure, look for, and experiment. And if we then do not measure any attributed things or effects of whatever, it is perfectly reasonable to conclude that the proposed god does not exist. This obviously does not mean that there isn’t any God. Proving the non-existence of that particular hypothesised God with specific attributes xyz says nothing whatsoever about God2 with attributes def or God3 with attributes ghi or God4 with attributes jkl etc. etc. The flip side of this is that the harder the believer makes it to test the attributes of his god, the harder he makes it to either prove or disprove his or hers existence. You can’t have it both ways. Proving a negative in theory or in practice? Another aspect of the question of whether or not we can prove a negative is the question what sort of proof we are talking about. Let’s say that someone claims that there are no WMD’s in Iraq. Is that provable? In theory: we can define what a WMD is (how much explosive or killing power does it have to have? when is it a weapon? (you can kill lots of people by drowning them, but a lake wouldn’t qualify as a weapon of mass destruction (or would it?)).) Then we could check all weapons in Iraq to see if they satisfy the established criteria. So yes, in theory we could prove that there are no WMD’s in Iraq iff there are no WMD’s in Iraq. In practice: or is it a question of practicality? Does someone who says that you cannot prove that there are no WMD’s in Iraq actually mean that it is undoable to check each and every location in Iraq? That person would make a fair point, though it would obviously in theory be possible to check each and every location in Iraq, one just needs enough manpower (enough manpower to check each and every location on the same day while watching all roads and tunnels because if you check location1 on day1 and location2 on day2 they could of course have moved the WMD from location2 to location1 during the night). In his 2007 book God: The failed hypothesis, scientist Victor J. Stenger uses this approach (it is also where I got the inspiration for this post). In the first chapter he explains the models and methods he plans to use in the rest of the book. It’s a philosophical chapter on epistemology (the philosophy of what can and cannot be known, and on the how and why of knowing and not knowing and certainty etc.) and very enlightening. This is an important point, for it means that verifiability isn’t a one-day thing. It is usually a long and arduous process of testing. Tests that come out positive could be false positives and scientists work very hard to make sure that that isn’t the case with their positive results. This latest quote hints at the spectrum of easily proven hypotheses and unprovable hypotheses. What sorts of effects a God causes, or what type of attributes a God has, can be the object of verification? Stenger lists a few (p. 41-2). He bases these on the God of the Old and New Testament. Again: if someone defines God in another way, that changes the game (but not the rules of the game). We would have to evaluate the characteristics / effects / attributes of that proposed god and check if they can be tested. Creating the universe, the structure of the universe and the laws of nature / physics. Changing the course of history / events at will and / or at random, including violations of his self-made laws. Putting human beings on a pedestal. Giving human beings immaterial eternal souls. Creating morality and human values. Revealing his truths through scripture and by communicating directly with certain human beings. The last page of the epistemological chapter gives us the generic scientific argument for (or against, depending on how one views it) the existence of god. Thinking Tools: You Can Prove a Negative, by Steven Hales, professor of philosophy at Bloomsburg University. Hales wrote this very excellent knock-out piece [PDF] about proving negatives. It’s only 4 pages long but covers virtually all possible angels to this question. Recommended highly! Stenger, Victor J. (2007) God: The failed hypothesis. How science shows that God does not exist. Twitter discussion on this topic (in Dutch) (which led to me writing the above).